I decided to try Martha Stewart's Double Chocolate Coconut Cookies recipe one day when I needed to make a quick dessert, but didn't have time to go to the store (luckily I had chocolate and coconut). I'd been holding onto the recipe for a while, unable to gauge from the ingredients and photo if it would be something I wanted to try. Well, its day in court had finally come. 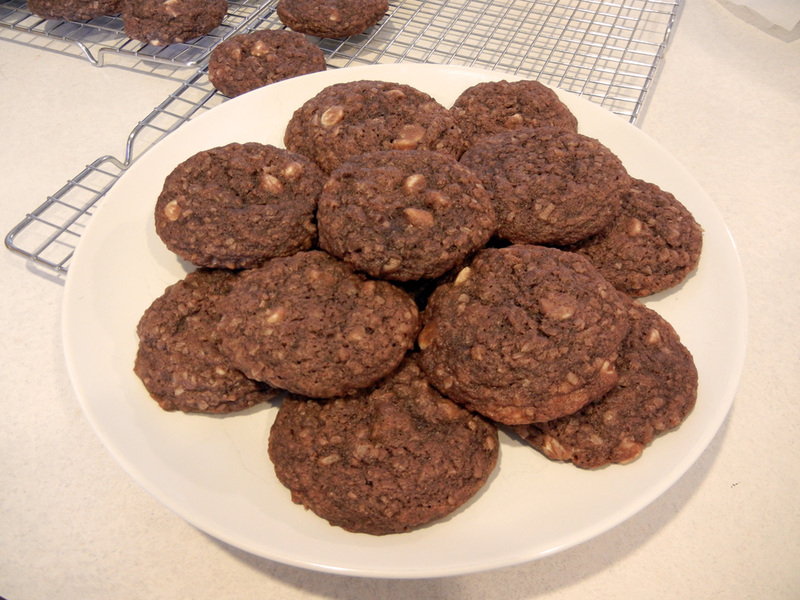 I have made these cookies a couple times since that day and I'm happy to report, they're a hit. My husband, who could usually care less about sweets (a fact that causes my brain to misfire with incomprehension), puts these in his top three favorite cookies. Even my son, who can't stand the texture of coconut, loves them (the coconut is well hidden, but essential). This recipe is a keeper for sure! I did make a few changes to the recipe. I left out the nuts (family is allergic), added another type of chocolate (changing it from double to triple), increased the amount of coconut, ground the coconut (hence my son's acceptance), and tweaked the process a bit. If you're looking for something chocolatey, tasty, and quick, these fit the bill. Give em a try! 2. In a medium bowl, whisk together the flour, cocoa powder, baking soda, baking powder, and salt. Set aside. 3. Put the coconut in the bowl is a food processor. Process until finely chopped. Set aside. 4. Place the butter and sugars in the bowl of stand mixer. Beat on medium speed until smooth. 5. Beat in the vanilla. Beat in the eggs, one at a time, until thoroughly incorporated. Beat in the coconut. 6. Add the flour mixture to the bowl. Mix on low speed until just blended. Stir in the white and semi-sweet chocolate chips. 7. Use a 1 ½” scoop to portion the batter. Place 2” apart on the baking sheets. Bake for 10-12 minutes or until set (where the tops aren’t raw and shiny). Let the cookies cool for 2 minutes on the sheets. Transfer to a rack to cool. Serve or transfer to a covered container until ready to serve.